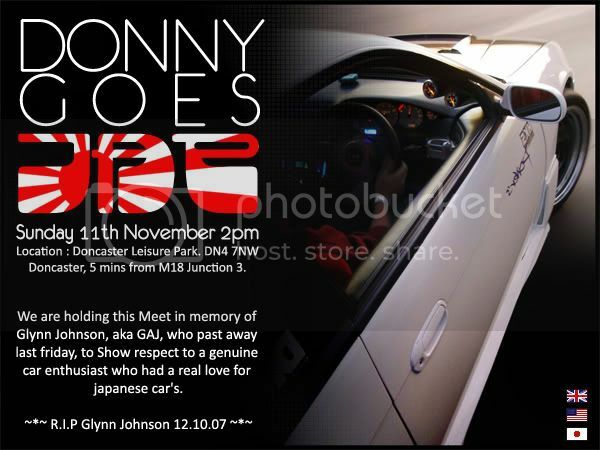 Donny Goes Jap "Glynns Memorial Meet"
Were holding this Meet in memory of Glynn Johnson, aka GAJ, who past away last friday, to Show respect to a genuine car enthusiast who had a real love for japanese car's. Were hoping for as much japanese peformance as we can possibly get! I will be posting this event on as many Japanese peformance forums and owners clubs as i can. Its Going to be at DN4 7NW, Doncaster Leisure Park. 5 mins from M18 Junction 3. There's going to be a burger van and the organiser has been in contact with some mag's so fingers crossed! we have had alot of interest for this meet with over 60 cars confirmed so far with 2 weeks left to go, we have been in touch with banzai and are just waiting for a reply so fingers crossed they will be there. Should be a good day with a great turnout so dont miss out dont feel you need to have known glynn to come - a big turnout will make his family proud. i can post names lists from other forums if anyone is interested. can we also start a list so i can get an idea of the turnout.